Everyone loves a good old-fashioned curriculum vitae, right? Surely that trusty two-page resume, with its ruthlessly edited summary of the academic and career highlights of your life so far, is here to stay? Nope, afraid not. The CV as we, or perhaps our parents knew it, is on its way out. But the good news is, a new way of representing yourself is on the rise – digital CVs. Not only are these better for employers, they also give job hunters a much better chance to shine at their very brightest. Before we get into looking at some of the defining features of a digital CV, let’s explore why we should be welcoming it to the job market. The traditional CV is typically quite a dry document. Formats obviously change, but the standard CV is a two page word document containing a short, usually chronological history of you, often presented via a well-structured collection of headlines, bullet points and short paragraphs. Extra curricular activities are bumped to back page, and the introductory biography (if you have one) is often written in third person. Employers can receive thousands of these documents, most of which will look and sound incredibly similar. Not only does this make choosing a shortlist of candidates hard, it’s also very difficult and time-consuming to check up on the facts contained in the resume. As this BBC article states, “in 2014, 63% of all the confirmed employment frauds reported to Cifas, the UK’s fraud prevention service, involved people lying about their education, former employment or qualifications.” What a waste of everyone’s time. And what an opportunity to reimagine a broken system. Welcome to the era of the digital CV. Unlike that pile of identical text heavy documents, each digital CV can be as different and distinctive as the candidate submitting it. Obviously it depends quite a lot on the position being advertised for, but everything from colour, to visuals, to font, to layout and content can be legitimately and creatively tailored by the candidate. Sure, there’ll be a few duds along the way, but that’s the same for traditional CVs and I know which pile I’d choose! The social web has already changed how recruiters and potential employers vet candidates before offering them a contract. With initiatives such as ‘digital badges’ now on the rise, we can expect to see many more digital CVs containing verifiable links to the claims made within them. But even without this development, a digital CV is likely to include all the social links that a potential employer would otherwise have to hunt out for themselves. No matter how hard you try, a word document is rarely going to be more interesting than a beautifully designed, interactive, constantly updated digital CV. Add to this the growing trend to create thematic or ‘story-led’ CVs, and to create video content rather than straightforward chronological lists, and you’ve got yourself some high quality content to enjoy! Although there may be a day when there’s no need for a straightforward two-page written resume of your life and work, today is not that day. Many (and depending on your industry, perhaps most) job opportunities still require this document. What’s more, the research and thinking you need to do in order to create a decent CV is still very much worthwhile. Even if you never end up using it to apply for a job, a short, incisive summary of your greatest hits will help you review your own progress and think about where you want to go next. 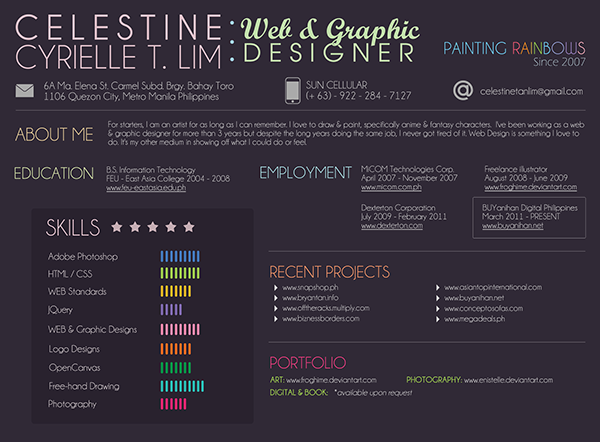 A digital CV may look pretty, but if it’s all style and no substance chances are it’ll do more harm than good. In fact, if anything, the rise of the digital CV will make the job market even more competitive than it already is, with the strongest candidates having more opportunity to show themselves off to their best possible advantage. Which is great if you happen to already be one of those, but perhaps something to think hard about if you’re not typically found at the top of the class! Just like the rest of our digital lives, a digital CV must be kept as fresh as possible. While a traditional CV can get away with a quick spruce up between outings, a digital CV is always live – and the moment it starts to look out of date is the moment it starts making you look bad.